So far the issue of Wildstar Attunements has been a fairly polarizing one in the community as a whole. So when I posted my write-up yesterday about why I didn’t think they were a horrible thing… I expected it also to be polarizing. If you look at my statistics for the day, that single post got more unique viewers than anything else by a large margin. However surprisingly even though it got forwarded quite a bit, I really didn’t end up with much commentary. I expected someone out there to tell me how wrong I am, but that surprisingly didn’t happen. I had a friend send me a private message about it however, thanking me for keeping my post “fair” and not adding to the vitriol. So is it because I approached the post from a calm place talking about my own experiences with bad attunement systems that folks didn’t have the knee jerk reaction to tell me how horrible I was? I am not so deluded to think that the majority of folks actually agreed with me. One of the things I see sometimes in the blogosphere is when one blogger posts about another, telling them just how wrong they are. I’ve done a few of these during my early days of blogging, but it really is not the type of thing I am interested in any more. There is more than enough negativity out there, that I really don’t need to add my own. I really hope that I can be a positive voice and talk about the good in things more than dwell upon the bad. Ultimately I appreciate every voice, even the ones I don’t agree with. 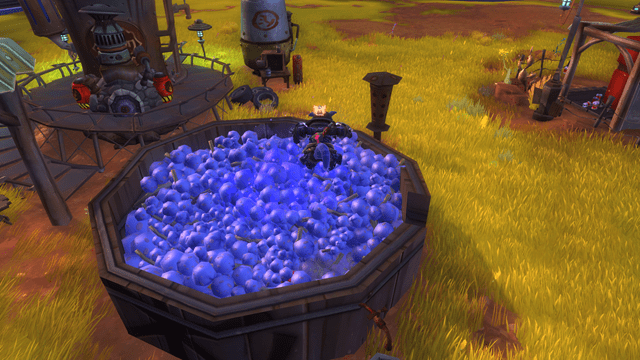 One of my favorite things in Wildstar is one that has surprised me. I normally have this odd relationship with mini-games in MMOs, and generally try to avoid them. However when I put the Moonshiners Cabin in my skyplot, I found the “This Aint No Bathtub Hooch” challenge to be insanely fun. Most of the housing challenges can be completed every 30 minutes, and often times I will stomp grapes to make moonshine four for five times a night. In part it is the rewards, or at least my attempt to collect all of them. The high end reward is the purple quality bed I wrote about the other day, which is cool but I already have one. The common rewards are either a neon beer sign or 150 reknown, and the rewards I am currently going after is the dye chest. It contains within it one of five random dyes, and I believe I only have three of the five currently. As a result I complete this quest over and over trying to get the last ones. As a side effect I have a truly silly number of beer signs, and I am basically covering the side of my ship in them. I am not sure if they are tradeable, but if you need beer signs… I am your man. The funny thing about it is there is zero market for them, because the Moonshiners Cabin is pretty much constructable by anyone who chooses to plunk down the gold it takes to build it. The question is… will I still care about it once I have collected all of the dyes available. It is a fairly easy and fun way to farm reknown, but I am just not sure if it is worth paying the weekly upkeep. That is the dirty secret that no one really talks about in the housing system. These cool things we can place, have to be repaired weekly to keep functioning. So far all of the ones I have placed have had a 1 gold repair cost, which at this point is still a fairly significant amount of money. So I have a feeling many of my things… including the crystal jumping puzzle will go away at the end of this week. My mission however is to find the upgrade to my mining plot, because that is one of those things I have found massively useful. As much as I have loved my time spent in Wildstar, I do feel bad that I have been horribly neglecting Elder Scrolls Online. Wildstar is the new shiny, and as a result is getting my attention as I have a strong desire to level and get all the shiny baubles that come with it. However this really doesn’t diminish my enjoyment of Elder Scrolls Online, because the games literally could not be any more different. Things is I enjoy both immensely and hope to continue playing them both for some time. As a result I am really looking forward to tonight. For some time we have had these semi-regular “Faff about in Cyrodil” nights, and after taking last week off I am ready to get back into the swing of things. The event should give me the focus to sit down and really enjoy Elder Scrolls for an evening. I am not sure exactly what we will do yet, but I had a ton of fun at that Nord town we stumbled across with the Dark Anchor, so if nothing else I would love to head back out there. Playing Wildstar and Elder Scrolls at the same time is an odd contrast. 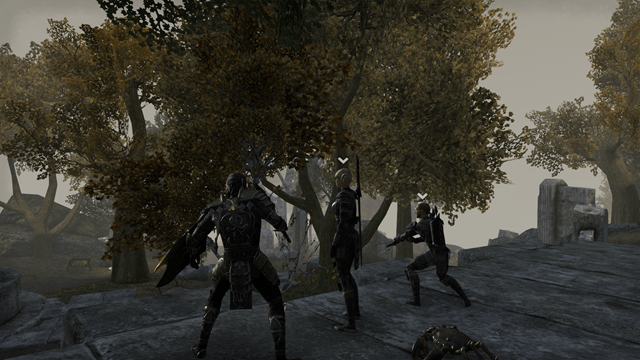 The one failing of ESO, is that it is extremely hard to group with other players. I really hope this is something they address in future updates because the game is in desperate need of better social systems to allow players to do content other than Cyrodil together. Ultimately we do it… only because that is what we CAN do as a large group. Without a mentoring system, we are pretty much limited to PVP content because it allows multiple levels to blend together and get bolstered up to level 50. I am mostly a soloist when it comes to questing, but the various folks who have tried to quest as a pair have found it extremely difficult to stay in sync while leveling. It has mostly worked for the folks that are always on at the same time, but for those who are not… if the partner gets even the slightest bit ahead it becomes extremely difficult for the other player to catch up. After seeing how cleanly a game can manage disparate levels grouping together, my hope is that Elder Scrolls adds in some functionality for this. The game is awesome, but other than PVP it is a largely single player experience. That said the game does have some of the most enjoyable dungeons I have experienced, but I wish they had taken a queue from Final Fantasy XIV and simply scaled players down to the dungeons level. After seeing this work in Wildstar I am shifting to the opinion that this is the way all dungeons should work. A dungeon should have a fixed level and it scales the player to that level for the purpose of the content. Sure give the players rewards for their own level… but scaling down blows away some of the problem with “out leveling” content, and makes it easier to help guildies out when the content has “grayed out” for you. 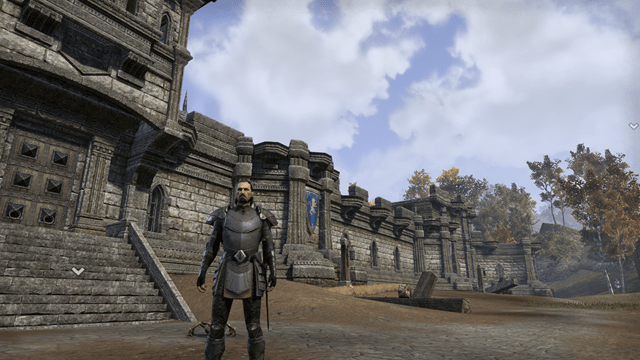 As stated above I will be playing Elder Scrolls Online and if you are Daggerfall Covenant I invite you to join in the fun regardless if you are in the guild or not. The plan is we will meet up at Northern High Rock Gate in Cyrodil around 8:30 CST. The guild is aligned to Wabbajack, and if we can manage to get people through the queue, it would be awesome to actually do this event on that campaign. The fallback to this point has been Volendrung, and I hope to be online early to try and assess the feasibility of Wabbajack for the evening. From there we will pick an objective for the night and wander off into the Cyrodil countryside in search of mayhem. If you are not a member of the guild, just add @Belghast and we can get you into the fray. 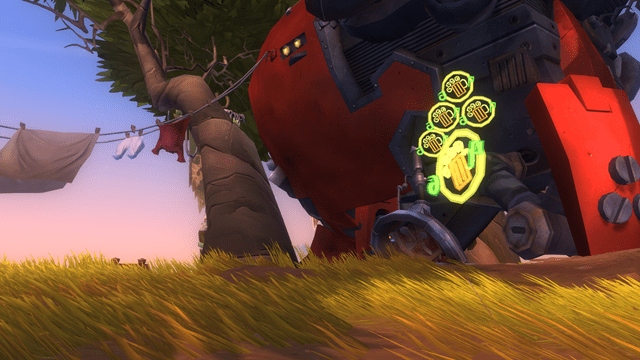 I am still not overwhelmed with excitement about Wildstar, but I am maybe starting to turn the corner on this game. Last night I opted to work on the warrior a bit more, and it turns out the area I was languishing around had no actual quests for me. One of the frustrations with the game is that the quest advisement on the minimap makes zero sense to me. I keep trying to figure it out, but end up just hopelessly lost as I keep opening my main map to find the objectives. I know there is some sort of a golden path system that you can turn on to get advisement but I find that whole process frustrating. All I really want is a blip on the edge of the minimap showing me where I should head to get to the next sequences of quests. Additionally I had mobs that I simply could not find. There was an NPC in town that no matter how many times I moved through an area, never seemed to be where the quest turn in location was marked on the map. All of this said, in my flailing I happened to stumble upon an instance of sorts revolving around trying to save Outpost M-13. I was woefully underleveled for the content but found it extremely enjoyable anyway. I entered the instance at level 10 and all of the creatures I stumbled across were 13 to 14. You start the mission as a hired shiphand on a cargo freighter delivering crystals. You are boarded and it is your job to try and protect the freight. I did fairly well here until it came time to fight the actual boss, and then I struggled a bit… having to try two or three times to get past him. Finally we land on a planet, that is absolutely gorgeous. You roam around with a 1950s style spaceman helmet, exploring what appears to be an asteroid with minimal gravity. What is awesome here is that when you jump you get hangtime like you would expect in lower gravity. Finally you wind your way around to Outpost M-13. The next sequence of events plays out like the movie Aliens as you explore the base and subsequent mine looking for either survivors or the cause of the catastrophe. 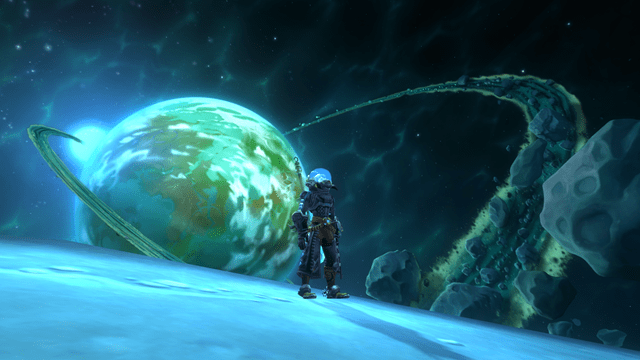 Mostly if more content like this exists in Wildstar… I might be happy to play it. While I simply could not chew through the hive queen boss, and will likely have to return “at level” I had a blast doing it. If nothing else this sells me on their universe, because stuff like that is really fun. The game still feels rather awkward at times, and I still have my problems with the warrior overall, but at the end of the day I am a melee player. 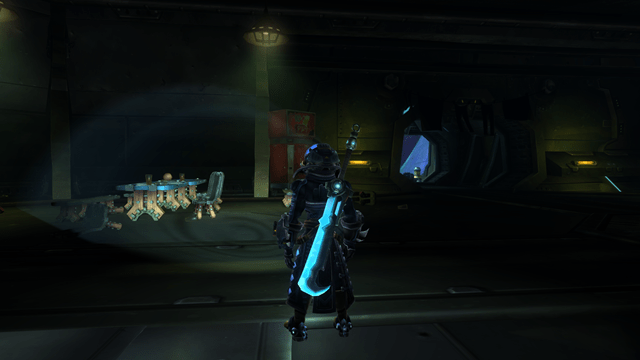 While running around as a Chua with a shotgun was fun, it just doesn’t feel like “me”. So while I am still having issues with their UI design a bit, I am hoping I can fix most of that with modifications. I need to do some searching to see if I can find a serviceable mini-map replacement. For roughly a week I had on the Anook Alliance of Awesome calendar an event called “Faffing About in Cyrodil”. The idea was to grab as many guildies as we could and head to Cyrodil looking for whatever we could do. When we pulled together and finally coalesced we had roughly a dozen players, and not the most balanced party… but we worked with it. At first we made a valiant attempt on Fort Glademist, that was currently being held by the Aldmeri Dominion. However we struggled to even take the Lumbermill. This was partially because we mostly just charged in aimlessly and spread ourselves too thin, but even more so that we were a group of bolstered to level 50 characters… and it was being guarded by actual veteran rank players. The problem with bolstering is that it levels you to 50… but the base stats for a 50 without the benefit of armor increases or anything of the sort. This means as a whole we represented a pack of level 50 paper dolls for someone to rip through. After making a couple of attempts we got tired of the running back and decided to shift focus to what my original goal was… collecting skyshards and beating bosses. The cool thing about Cyrodil is that it is pretty much a normal questing zone in addition to being a zone full of PVP objectives. So we wandered around the zone, often times aimlessly, collecting the various skyshards along the way. At the end of the night I was up three skill points and had dinged 49, and various other folks in the party had dinged as well. The dungeons in Cyrodil are really good experience, not to mention insane amounts of loot. 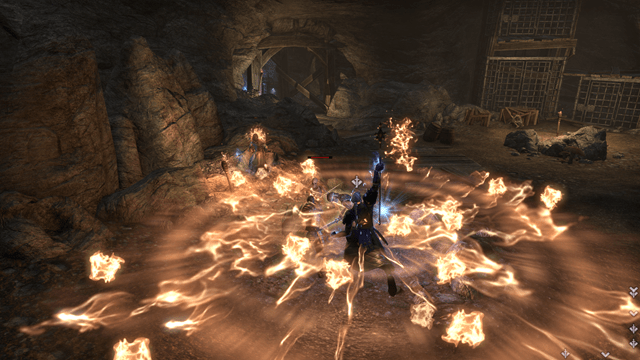 It is somewhat sad that instanced dungeons are rather pitiful experience if you are not completing the quest, however you can gather up a group of friends and roll through the Cyrodil dungeons for hours and almost level exclusively that way. The respawn is fast enough that we were constantly having to fight our way back out of the dungeons as stuff was popping only one or two packs behind what we had just killed. I was streaming last night and captured almost the entire thing, and as always posted it up on my youtube channel. It seemed like folks were having a good time, even though we didn’t really have any success at the PVP aspect of cyrodil. It is my intent to do this more often, and I will likely be trying to schedule another one of these nights for next Wednesday. However I think I am going to try and start it a little earlier in the evening. As the night drug on, you could tell that most of us were barely holding in there. This is the negative side effect of being a guild almost entirely made up of 30 somethings… and mostly LATE 30 somethings and 40 somethings. Five thirty in the morning comes really early, so I personally try very hard to head towards bed by at least 11. For our east coast folks that had a lot of them staying up til midnight or so. Hopefully with time we will find a happy medium that works for both the east coast and west coast contingencies. I want to lead off this morning by thanking everyone that responded yesterday to wish me well on my five year blogoversary. It still seems a bit strange that I have been doing this that long, well technically I have been doing “this” the whole daily blogging thing only a year. All the support you guys have given me has been awesome. I greatly appreciate you all in so many ways. I still feel like I don’t know what I am doing, but I just keep doing it anyways. At this point the blogging thing is so ingrained in me that I think I would continue to post daily even if I had nothing to talk about. Thankfully I always seem to be able to at least incoherently ramble, and that tends to fill a page faster than anything. While we are on the topic of blogging and thanks, I wanted to take a quick moment to talk about the Newbie Blogger Initiative. I have touched on this a few times over the last few weeks, but it is approaching quickly. May First is the official launch of the 2014 edition of the Newbie Blogger initiative, whether you are a veteran blogger or someone who has always wanted to create a blog… we need you. This year proves to be a really interesting run as things are changing up quite a bit. There are awards with prizes attached to them for various things. Additionally we will have a return of the Syl’s ever fun NBI Poetry slam, as well as some event nights. Right now a massive hearthstone battle royale has been confirmed, and you can check up the sign up information here. There is also a great idea for a League of Legends night, that I hope gets enough support to make as well. The thing about blogging is for every one of us that are blogging daily, there are another batch that have either abandoned their blog or are sitting by the sidelines trying to muster the nerve to start blogging. I was one of those people five years ago, and a similar community got me started. I implore you to embrace this opportunity and either reignite your blogging passion or light a brand new spark. Folks are constantly saying that blogging is dead as a medium, but each of us that do so regularly are thumbing our noses at this concept. We need fresh blood to keep this gaming blogosphere alive and healthy and events like NBI shine a bright light on new talent. This will be my third year supporting the effort, and I look forward to seeing a new crop of bloggers step up and do a better job than I ever could do. Since I had not streamed on twitch in a few days I decided last night I would fire it up while I wandered around in the desert. Alik’r is an interesting zone and almost feels like two zones. There was a series of frenetic feeling quests in the town of Sentinel as you saved it from a zombie invasion. All the while doing so there was a call to purpose, a feeling that you had to keep moving or something horrible would happen. Now that I am out in the desert proper, the feeling of the zone has changed again. Now as I sift through the dunes looking for various points of interest, the feeling seems to be much more relaxed and similar to the way Stros M’kai felt. This is good and bad, good in that I feel like I can take my time through the content… and bad in that I am horribly prone to completely lose focus. One of the things I am really loving are the creatures out here. The game does a really good job of disguising the fact that you are often fighting the same damned creatures over and over. The first time I really noticed this was in beta and playing the different starter zone experiences. In Ebonheart you had the fiery Shalk, Aldmeri you had Thunderbugs, and in Daggerfall you had Assassin Bugs. They were all essentially the same mob, but each performed slightly differently in the kinds of attacks they would do. In the desert of Alik’r I noticed that Dunerippers were essentially crocodiles but vastly different in appearance. They shared quite a bit of similarity in the base model and the sweep attacks, but also incorporated the mudcrab dig attack and a model swap. Noticed the same thing happening with the Jackals, that look extremely different from wolves but behave almost exactly the same. All of this give a feeling that the world is related, and that the various creatures of Tamriel evolved from the same core at some point. I think that is the thing I love more than anything else, that everything in Elder Scrolls Online has a certain “sameness” to it. It all feels like it is part of the same world. While a Dwemer ruin in Skyrim might look vastly different from one in the Alik’r desert… they all feel like they were from the same race. This adherence to a “racial stylebook” makes the game feel amazing. One of my big fears with Elder Scrolls Online and the announcement of the three factions is that they would somehow destroy the natural diversity of the Elder Scrolls setting. However thankfully you are just as likely to find a Dunmer or Argonian NPC in the desert as you are to find a Redguard in Riften. 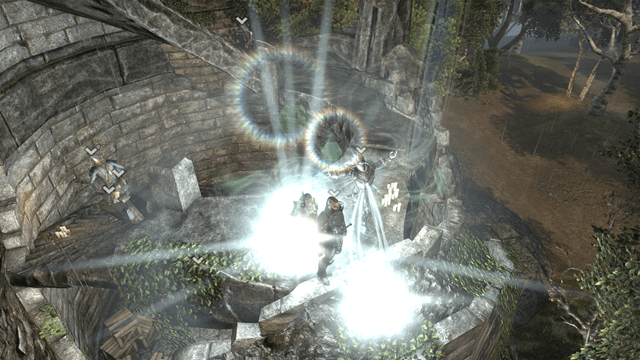 The game has managed to maintain the jumbled mess that is the Elder Scrolls setting. After awhile hanging out in mumble by myself I was joined by the illustrious Zelibeli and Jabberant, who decided they were on their way out to Cyrodil. This was to be Zeli’s first foray into the frontiers, so I decided to halt my questing and tag along. I warned them that I sucked horribly at PVP, but still managed to love Cyrodil. In every conceivable way it is the Dark Age of Camelot frontiers. You have three different realms that border the region, with lots of objectives scattered around the map. Just like Dark Age of Camelot there are also numerous other things to do out there than just PVP. We attempted to meet up with one of the bigger conflicts at first, but ended up getting completely rolled by a veteran three player a few times. One of the interesting things about Cyrodil is that it instant levels you to 50 for the purpose of the content. The only problem is it bolsters you to the BASE stats of a 50… not a 50 with full gear. This means that a bolstered character will always be significantly weaker than a true 50… and even weaker still than a veteran rank player. In large scale siege warfare this really doesn’t matter much since it is mostly a numbers game. In one on one combat… the difference is extremely noticeable. I felt like I simply could not deal enough damage to the veteran rank 3 player. While I out survived both Zeli and Jabb this was simply to my tanky nature more than anything else, and still even after having fought two other players the guy completely wrecked me. As a result we ended up varying our goals and we set our sights on a skyshard. One of the add-ons I have apparently shows the locations of all of the skyshards in Cyrodil, so I figured this would be a valuable excursion. So we made our way to this tower guarded by goblins, with the skyshard very clearly at the top. It took a few tries to finally reach the goal, as the moment we reached the tower initially we got attacked by several folks from Ebonheart also after the same goal. One of the cool things is there at the tower we picked up a quest to deliver a doctors bag to a town there in Cyrodil. We did not do this however as the town in question was deep within currently Ebonheart held territory. That seems like a grand mission for another night. After a lot of faffing about we ended up picking up another guildie, Barose and heading to a dungeon. I think it is really awesome that there are full dungeons scattered around the map in Cyrodil. This one was a really nifty vampire dungeon and I ended up getting so much loot that I had to “mail bank” a ton of it to Rae. Apparently I ended up sending her 9 emails full of it before the night was up. The PVP dungeons seem to drop loot as though they were a group dungeon, but overall seemed easier in scale. I am guessing they are rewarding us for the risk of doing PVE content in a PVP zone, where any group of players could hop into the dungeon and slaughter us in the process. Overall it was a really great night and there is talk of trying to create some sort of formalized guild Cyrodil night. If nothing else last night proved that there is plenty to do in Cyrodil even if you do not necessarily engage in siege warfare. While I am not opposed to defending a keep or claiming one for our guild, I also want to explore all of the other dungeons out there and collect more skyshards. For the longest time I had a point where I simply did not know where to spend points, but having leveled up a lot of abilities I seem to once again have more opportunities to spend them than points to spend. I had a great time and I hope Zeli and Jabb both did as well. Was really fun just hanging out and being horrible at PVP together. You should totally join us the next time. Yesterday was the second day in a row I managed to hit the default goal of 10,000 steps since I got my fitbit. While I normally clock in at the 8,000 steps range I have actually hit 10,000 four times so far. As I wrote when I got my fitbit, it makes interesting tweaks in the way you look at the world. These last two days I mostly performed a simple tweak to my routine. I spend most of my life pushing as many things as possible to autopilot, and as such… unless it is super important I try and make things absolute routine. As a result I prefer to park in exactly the same place every day, so I don’t have to think about where I parked. The only place that is reliably open is the roof of the parking garage, and while I do try and find a covered place when there is bad weather… it works for me. Normally speaking I have been going up and down the stairs from the roof for a while now, but I opted to make a slight tweak in this routine. Instead of walking the stairs, I decided to walk the long winding ramp between the 6th and 4th floor. This is a large number of new steps to add to my routine, and I think is really the difference between consistently having 8,000 days and 10,000 days. My other friends that are also using the fitbit tend to skew the results by walking in place at night or pacing the halls to try and finish off their steps. I however wanted to try and tweak my routine to a point at which it was sustainable and repeatable, and slowly over time I am getting there. A new thing my wife and I have been doing in the evenings is attempting to walk to dinner. Granted we live in the suburbs and it is not exactly designed for walkability… but we are making it function. There are a number of restaurants that are within a mile of the house and Wednesday night we walked a grand total of 4200 steps to RibCrib and back. Last night she got home super late so we didn’t do this, but instead walked around the corner to the grocery store to buy a ream of paper and some advil. It seems that if we are walking someplace with a purpose in mind, it is easier. This is still very new to us, but so far we both seem to be adjusting well. The only negative is that I seem to have developed shin splints which hurt like hell, but hopefully they will lessen over time. If you remember some weeks back there was a question as to which campaign to choose. After much discussion we ended up picking Wabbajack, and apparently this was a very good choice. It seems as though the Daggerfall Covenant is doing extremely well there, and when I logged in last night we had the faction wide buff indicating that we had crowned an Emperor. In addition we managed to hold all of the elder scrolls, but as my friend Kodra reported it looked like we were about to lose one of the keeps holding a scroll. I feel a little bad that as cool as Cyrodil seems, last night was the first night since the mandatory pvp testing weekends that I had set foot in it. I completely skipped the tutorial quests, which are apparently really good, and worth a lot of skill points… and jumped straight into combat. I had more fun than I have really had in PVP ever… or at least since Dark Age of Camelot. We successfully defended the keep, and took several objectives around the keep. What was nice about defending the keep is that we were able to consistently push Ebonheart Pact away from the siege weapons and destroy them, giving our keep time to repair. I died a ton, but also managed to get in my fair share of killing blows thanks to being able to shield charge into targets. I pvp’d as sword and shield and overall I was pretty pleased with the results. I might tweak things up a bit, to add a bit more annoyance to my toolbar. I managed to get three skill points and at the end of the night was halfway through realm rank two. All in all it was a fun little outing and something I could see doing again in the near future. For some time I have been streaming in the evenings from time to time, and in doing so I hop on mumble and join a channel called “Bel is Streaming”. Folks pop into the channel and we end up chatting about damned near everything but the thing we happen to be playing. When I went back and listened to some of the videos… they almost sounded like impromptu podcasts. This started a discussion among a few of my friends and is slowly working its way towards a real podcast. There is a group of friends that I have been hanging out on mumble with on an almost nightly basis. Over this time we have developed a really good chemistry, and the goal is to take that same chemistry to a podcast. So sometime in the very near future we will be recording our inaugural episode. I will be joined by my good friends Rae, Kodra and Ashgar. Between us we each have just enough overlap of tastes to make it work, and just enough divergence to hopefully make for differing points of view. Rae is currently working on some really amazing Chibis of us to eventually become a logo. Special thanks to Sypster to answering some questions and helping me pick a libsyn package. We don’t really know what we are doing… but that is okay, we all have to start out not knowing what we are doing. Right now the gameplay is to keep a google doc going with potential topics, and then just see what happens on air. Hopefully it will be something worth listening to.